Starting your own craft business can be a great way to earn extra income while pursuing your passion. In fact, you may find that your home-based business soon turns into a full-time endeavor! Recently, Anne-Maire Faiola, founder of Bramble Berry, took time out of her hectic schedule to let the readers of LoveToKnow Crafts discover what it's like to run your own craft business. Could you briefly describe your business to the readers of LoveToKnow Crafts? Bramble Berry Inc. sells raw materials to make your own soaps, lotions, toiletries, and candles at home. You can do it for a hobby or even start a small business that works easily with your schedule. Bramble Berry runs a soapmaking party retail shop called Otion in Bellingham where people come from all over the world to learn how to make soaps and lotions. Bramble Berry also manages a daily craft blog and an instructional web site. 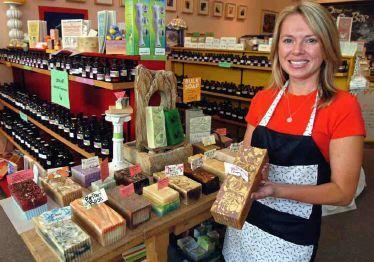 What inspired you to turn your love of soap making into a home business? In short, misery. I thought I wanted to be in corrections and police work but when I got into the field, straight out of college, I realized that I was not a good fit for that line of work. 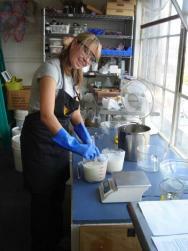 I turned to the one thing that was making me happy, soapmaking. I always intended to just keep the business small and easy. When the business started growing, no one was more surprised than me! What is the most difficult aspect of self-employment? What is your favorite part of your job? Starting your own craft business is an adventure, but it's also a lot of work. Staffing stressors: Am I being a compassionate boss? How can I pay more? Did I come down too hard on XYZ because of their poor performance? How can I be a better leader to my staff? How can I properly motivate without having the financial resources to compete with larger companies? How can I keep up with staff personal lives and interests without being too involved? Money stressors: How do I pay for the entire Christmas season ramp-up in June, our slowest month? How do I keep my staff on during the summer when we don't have the business to justify it? How can I expand without a bank loan? How will I pay our mortgage if we have a down month? I've personally signed every note, every Net30 application and every mortgage that Bramble Berry has. It is a lot to keep me up at night. Family stressors: I haven't seen my parents in a month because I'm always working. Am I a bad person? I have to make a rule with myself to make sure I am home two nights a week by 6 p.m. to have dinner with my husband. Does this make me a bad person? I snuck out of bed the other night to answer emails and hoped my husband wouldn't notice. Does that make me a bad person? Am I a bad wife if I answer emails from bed while we're supposed to be watching a movie? Personal time constraints: How can I fit workouts in when I'm working 12 hours a day? How can I be a good friend if I'm forever canceling on my friends? Hobbies? What hobbies? What could be better than a job that lets you play with bath and body products? Control: I design the strategy for the company, do the sales, and work on all the branding and marketing plans. I have control over who to hire, what kind of workplace to promote, the warehouse layout and even what kind of toilet paper to buy. Do I actually care about our toilet paper brand? No, but it's nice to know I could if I wanted to. Freedom: My job is largely my responsibility. If I need a flexible day, I can have it. If I want a long weekend to go visit my parents, I can do it without asking. If I want to change my work hours, I can do it to better suit the latest yoga/spinning/running class I want to take. Great people: My staff are amazing. Period. Every single one of them is a person I both like and respect. Every single day, I am thrilled to have the opportunity to work with colleagues who amaze and inspire me. 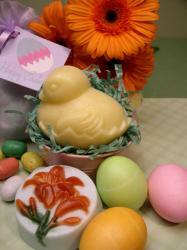 Cool products: I play with bath and body products for a living. Seriously, how lucky am I? Access to the best mentors around: Owning my own business gives me access to other entrepreneurs, all of whom are cooler, smarter, more successful and more driven than I am. The learning opportunities are endless. Inspiring women all over the world to start their own micro businesses: Mentoring small businesses is inspiring and a joy. In your opinion, how has the Internet affected opportunities for crafters who wish to start their own businesses? 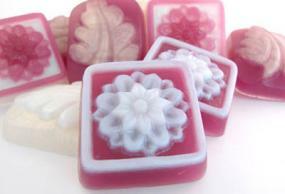 Bramble Berry's supplies can help you learn to make your own soap for fun or profit. The internet has taken away much of the traditional barriers to entry. It's easy to set up a web shop, targeted advertising is easier and who doesn't love the factor of no-printing costs? Unfortunately, the low barriers to entry mean that there are a lot of crafters out there that can easily start a business so differentiating yourself through great marketing, superb customer service and coherent brand packaging is important. Is it possible to start a home-based craft business if you don't have much money to invest? Of course, start small with one store and then add another with the profits from the first. Keep doing that for 12 months and all of a sudden, you have 12 stores grossing $500 per month and a $6,000 a year business. What could $1,000 net profit for you do for your family? Pay for soccer camp for your daughter? Buy your son piano lessons for the year? Start small, start today and keep building slowly. You will be surprised how pain-free it can be if you start small, grow slowly and enjoy yourself. A craft business can be fun for the whole family. Do you recommend asking friends or family members to help with your home-based business? If so, what is the best way to make sure the project doesn't have a negative impact on your relationship? That's a tough one. Of course your family will end up getting drafted to help you. Teaching your kids about business and finances is a lesson that can have a positive lifetime impact on them. My own father taught my brother and I how to invest and how to read stock reports when we were 11 and 14. It was the start of a firm foundation in financial literacy. It was a wonderful gift. However, it's difficult to forget that your family are not your happy, helpful employees and have their own lives and interests. Speaking from experience, it is impossible to comprehend that your family would betray you and not totally turn into happy soapmaking automatons once they saw how important your new home business was to you. Draft your family, cautiously. Be thankful when they can be help. Temper your bitterness when they can't help. Pay them if and when you can. What resources do you suggest for crafters interested in learning more about self-employment and home-based business opportunities? Fortune Small Business (FSB), Inc., Business 2.0 and Fast Company will provide a quadruple threat if you read them all cover to cover, every month for a year. You will learn most everything you need to know about starting, running and managing your business with this at home lesson. If you want to add some extra books, my favorite is Mastering the Rockefeller Habits: What You Must Do to Increase the Value of Your Growing Firm by Verne Harnish. Of course, find the best and the brightest entrepreneur you know and ask them to help you build a stable, lasting business. You would be surprised at how fulfilling a mentoring relationship can be. To learn more about starting your own craft business, check out the articles at LoveToKnow Business.